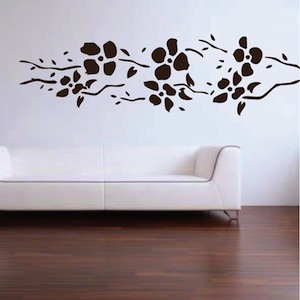 Add floral accents to any room with our Trendy Floral Branch Decal. Choose a size and color that suits your space. All our vinyl wall decals are removable therefore they are perfect for permanent or temporary decorating. Our vinyls have a matte finish, they will appear as if the designs are painted on your walls. Designs available in over 40 colors. We use the highest quality vinyl and we have the best prices. Great product with clear instructions. I applied it vertically to a door. Even with the door down and on a table, it was MUCH easier with 2 people. Something to consider before you unwrap it! Now it looks wonderful.